For culinary arts students, there are comprehensive schooling opportunities in the UK, most notably in London. Stand-alone cooking schools operate on a scale that includes intimate niche cookery schools, and well-known industry educators like Le Cordon Bleu. Whatever your career aspirations, one road toward culinary success starts here. London is an international city, drawing visitors; and culinary influences, from across the globe. Gastronomically, the city is hailed as inspirational, for its dynamic blending of international flavors. 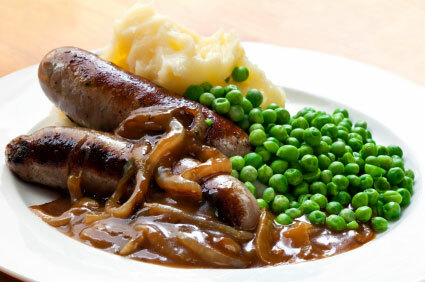 Dishes and ingredients from a variety of cultures find their way on to London menus, but there are English classics too. Several British chefs have risen to the top of the food celebrity business. By putting their own culinary points of view on display, the English constituency of TV food fame has furthered the world's appreciation for progressive English cooking. Jamie Oliver has achieved pop icon success, but still plays a key role in putting apprentice chefs to work/study in his Fifteen London restaurant. Gordon Ramsey is known for his on-screen antics ala Hell's Kitchen, but his chef chops have been in place long enough to earn him consistent Michelin 3-star ratings at his London restaurant. Graham Kerr, the infamous “Galloping Gourmet,” is a celebrity chef pioneer, and one of the first to build his franchise on healthy cooking methods and wholesome ingredients. Your London chef's education is an international exposure that might put you to work on the line with your favorite English chef. But if time spent in London serves as a launching pad for culinary lift off outside the UK, your exposure to traditional English food provides a valuable resume entry that is sure to advance your chef career. 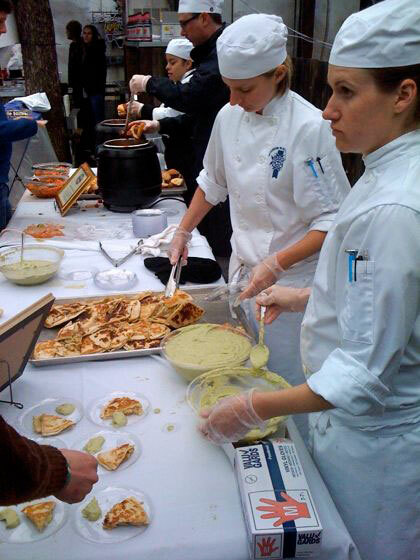 Le Cordon Bleu – London -- The King of all culinary arts schools is right at home, on campus in London. Le Cordon Bleu delivers a comprehensive, world-renowned education, rich in classical French culinary technique and worldwide cuisine. Chef students learn from master chef faculty, in intensively focused programs that cover all the culinary bases. The highly coveted Le Grand Diplome Cordon Bleu is earned by students who complete each of the school's study tracks, Cuisine and Patisserie, entirely. Each discipline is broken into three 11-week courses at the basic, intermediate and superior levels. A Diplome de Cuisine or a Diplome de Patisserie can each be earned separately, in less than a year, by completing basic, intermediate, and superior studies in either discipline. Completing all three levels of study, in both areas, comprises the master degree known as Le Grand Diplome. Students typically spend 18 hours each week on the cuisine portion of the curriculum, with an additional 15 hours devoted to patisserie. State-of-the-art kitchens and bakeries replicate commercial facilities that employ students upon graduation. Demonstrations, followed by practical application of skills learned, provide the time-tested mode of study embraced by the LCB. Following several decades of successful London operations, Le Cordon Bleu recently opened a new Flagship international institute in February 2012. The Bloomsbury Square campus houses Le Cordon Bleu's first European cafe, as well. Master chefs from the school prepare patisserie, boulangerie and viennoiserie throughout the day, for patrons to enjoy on-premise or to take home. Lunch is served daily, and while the menu is limited, the selection of soups, salads and sandwiches are exemplary. Leith's School of Food and Wine -- This London-based school specializes in degree programs for professionals and classes for serious cooking enthusiasts. A Professional Diploma earned from Leith's is a respected credential within the industry, and one that advances career chef agendas. The program utilizes dynamic instructional methods, including master chef demos, field trips to food markets and fine restaurants, and hands-on internships that reinforce campus learning. Three certificates are earned on the way toward a coveted Leith's Diploma. The Foundations Certificate cements knowledge in technical fundamentals like knife skills and classical cooking styles. The Intermediate Certificate focuses on classic recipes, soufflés, game and fish, and pastry proficiency. Advanced Certificate candidates are tasked with perfecting complex dishes and sophisticated sauces. Advanced pastry and spun-sugar work is another phase of advanced certificate studies, as well as expanded wine studies, menu planning, inventory and cost control and entrepreneurial budgeting. Throughout your full-time education at Leith's, you'll be dispatched for internships and catering work, as well as fact finding missions to the Billingsgate Fish and Smithfield Meat Markets. Cookery School – At Little Portland Street –Chef education comes in many forms, and this unique little school qualifies as an alternative learning method for domestic cooks and experienced pros. Rosalind Rathouse founded the school with 40 years of culinary teaching experience behind her. As a result, the niche school conveys recipes and techniques in an accessible way for pupils from various cooking backgrounds. Straightforward instruction in ‘pure' cuisine, unadulterated by the ‘fusion' of eclectic food influences, imparts fundamental understanding of traditional cooking. Sustainability and responsible practices are emphasized as a curriculum component that embraces organic and other environmentally sound food production methods.